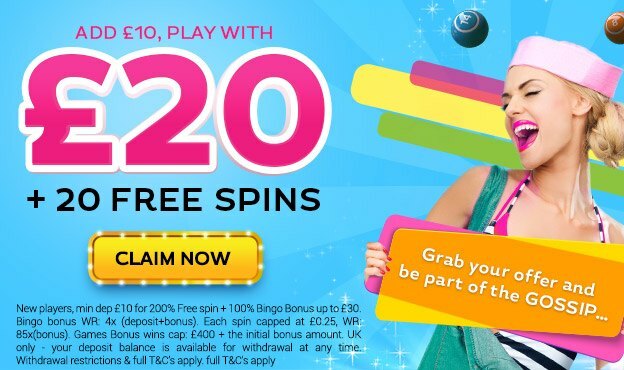 New players, min dep £10 for 200% Free spin up to 60 spins + 100% Bingo Bonus up to £30. Bingo bonus WR: 4x (deposit+bonus). Each spin capped at £0.25 which can be played exclusively on irish luck, WR: 85x(bonus). Games Bonus wins cap: £400 + the initial bonus amount. UK only - your deposit balance is available for withdrawal at any time. Withdrawal restrictions & full T&C’s apply.. Play with £20 + 200% spins match! Come join the party at Gossip Bingo! Make your 1st deposit of min £10 and you’ll receive 100% Bingo Bonus up to £30 + 200% spin match up to 60 Spins! What are you waiting for? Grab your bonus and play today!